SE VCH , Dt.-DRC Ch. (m. Arb.) - Tollartrollets Molle "Mika"
In 2016, we expanded our experience in hunting and started with another hunting subject/topic: tracking. Tracking was new both for me and for Mika, who used to search (or track) before this only with a high nose. For me, this was also a new training approach, where I was not allowed tohelp the dog during the search, but instead allowed him to trust only his nose. So both of us learned a lot of new things, like for example that there is a huge difference in the style of tracking between Mika and his son, Indy. Mika, as it turned out, is more hesitant on the track and tracking on his own does not come naturally for him. Instead, Mika loves to work with me and to tackle a problem while by communicating with me. Nevertheless, we started with 3 open tracking exams, and he passed all of them, taking two first prizes and one third prize. We will see if we will obtain the tracking champion title next year. We also visited the ”Toller Specialen” in August 2016, and we took part in two tolling exams in the open class. During the first exam, Mika couldn't find the last duck in the free search, so we got only the second prize. In autumn, we tried again and Mika completed all tasks very nicely, and we got the first 1 price in the open class. I'm very proud of Mika's development in the last years. At the moment, he is extremely self-confident in his work with dummies or game. He is strong, vital, and always ready to work. Next year we will try to reach and pass a tolling exam in the elite class. That will be really awesome. Mika also completed his DRC Show Champion title (German Retriever Club) and he is now an official Show Champion with hunting merits. I hope Mika and I are able to work many, many years more and that I can see the bright sparkle in his eyes for a long time whenever we go out for training, hunting or exams. 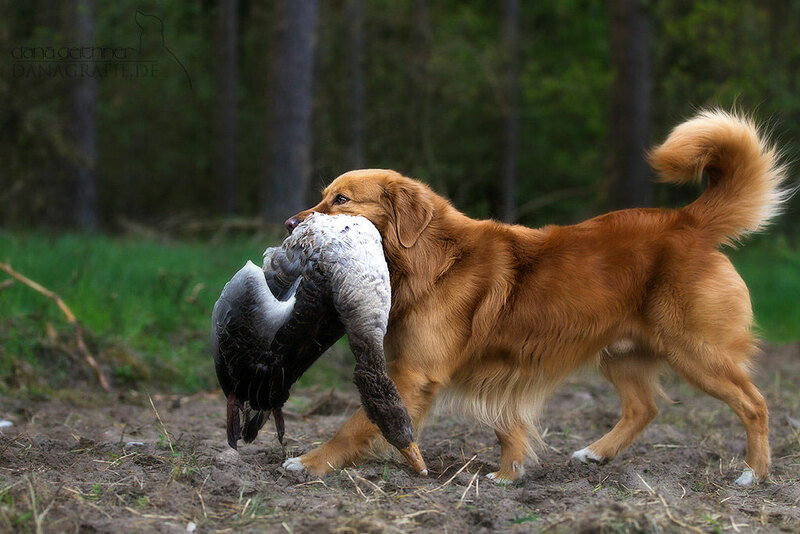 The past year was influenced by the new theme "hunting". After 3 weeks of hard studying I passed my hunting exam and now I have a German hunting licence. Mika passed his first Tolling exam with a first prize in the beginners class and a second prize in the advanced class. In addition he passed the German BLP (Bringleistungsprüfung) with very good marks and got the third place. But we also took part in a workingtest in the advanced class and got a "good" score with 92 from 120 points. Beside the work, Naatti and Mika gave me the most important present of the year. The six puppies were so nice in temperament, behavior and appearance that after a lot of thinking about the pros and cons it was clear that I want to take one of them. As a new member of our pack Indy settled down so fast and effortlessly that it feels like we have never been without him. One year ago I thought Mika was a grown up dog. But now I finally understand people who say that a dog needs time to show fully his character. It's so interesting to see how his behavior still develops, even his body has already matured. I'm very curious about his futher future! So for Mika and me it was a successful year with a lot of fun and new experiences. I'm very thankful for all the good friends I met because of Mika, Indy and my dog school. It's a treasure which I really cherish. Die Spezialen in Schweden sind vorbei und ich bin immer noch ganz begeistert von diesem wirklich tollen Event. Mika konnte auch begeistern und erntete den 5ten Platz im WT in der öppet klass und den 3ten Platz in der Gebrauchshundeklasse in der Show mit 25 anderen Rüden! Und wir sind jetzt im Tolllingfieber. Mal sehen, was noch alles kommen wird. In diesem Jahr haben wir bisher die Dummy F mit einem sehr guten Ergebnis bestanden, uns an einem Team WT mit einer sehr guten Freundin gewagt und 3 Workingtests (alle inoffiziell) in der F Klasse absolviert. Mika konnte in allen Prüfungen seine schnelle und ausdauernde Arbeit, seine sehr gute Einweisbarkeit sowie seine schöne und ausdauernde Sucharbeit abrufen. In der Wartezone war er dabei entspannt und legte sich gerne für ein Nickerchen unter einen Baum. This year Mika passed the drc advanced dummy exam with a "very good" and we participated at three unofficially working tests at advanced level. To my opinion he presented himself very well and I'm very much looking forward to the things will happened the next year.